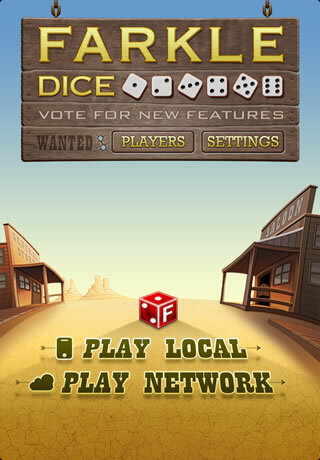 NEW FEATURE – Play Farkle Dice Free with anyone anywhere in the world on your iPhone or iPad. Open your QR reader and point it to this tag. Have you updated your Android phone or tablet lately? If yes, then make sure to get the latest versions of our games here. Thank you for playing our games. As an independent company, we rely on word-of-mouth to spread the fun about our games. Please pass along this newsletter. 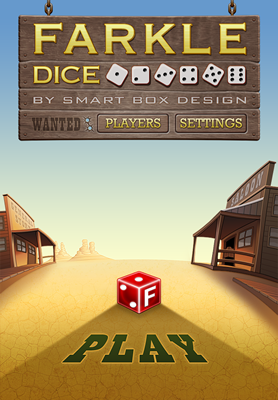 By Todd (Admin) Posted in Smart Box Design	| Comments Off on 2,000,000 Plus Farkle Downloads! Smart Box Games today is proud to announce that their highly entertaining Farkle game app series has been downloaded over 2 million times. 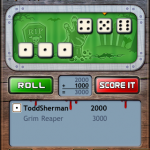 This milestone makes the Farkle series one of the most popular dice games available for iPhones and Android phones and tablets. 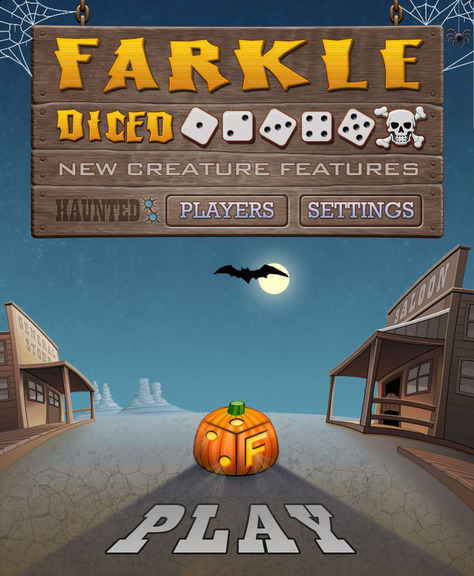 The series consists of Farkle Dice, a two or more player game, Farkle Solo, a single player version designed for players who love leaderboards, and Farkle Diced Halloween, a spooky version of Farkle Dice. 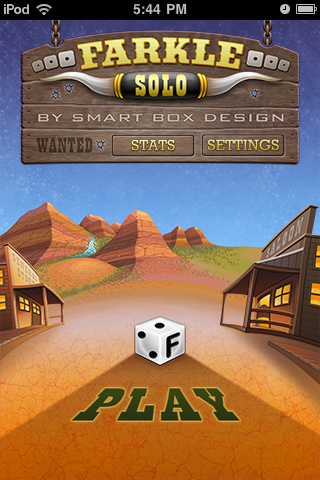 Smart Box Games is known for the attention they places on both the playability and design of its games, and the Farkle series is no exception. The art is beautifully drawn with rich hues and the music and sound effects are both thematic and entertaining. The series has an average 4.5 star rating in both the iTunes and Google Play stores. 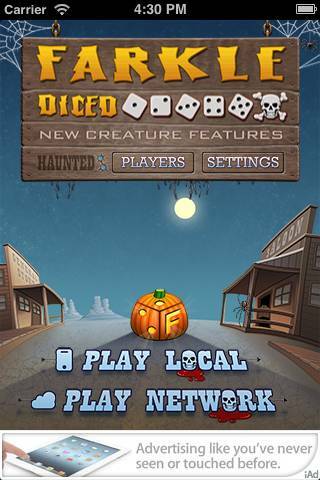 Farkle Dice, Farkle Solo, and Farkle Diced Halloween are available for free. 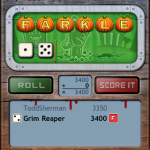 Farkle Dice is available in 6 languages. Welcome to our December Newsletter. 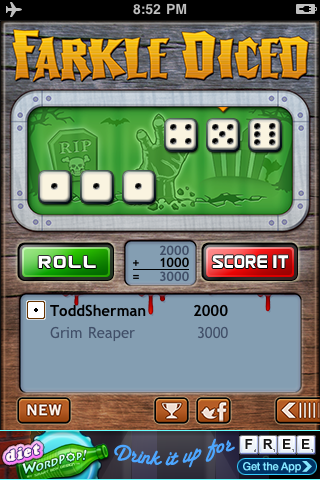 We have a brand new FREE dice game. Use the handy link below or point your phone’s camera with a QR reader to install Farkle Solo directly to your phone or tablet. 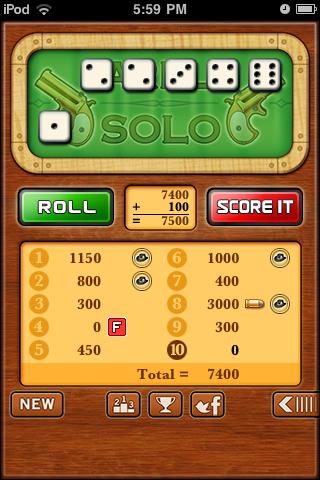 Farkle Solo at High Roller Saloon is an exciting fast paced dice game. Score the most points in ten rounds to be today’s high roller. On your iPhone, open your QR reader and point it to this tag. Try to beat your best score or your friends. Are you ready to risk it all to be the star of the saloon? 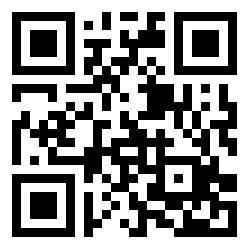 On your Android Phone, open your QR reader and point it to this tag. Thank you for being a loyal Smart Box Design Member. We rely on word-of-mouth to spread the fun. If you think your family and friends would enjoy playing our games, then please post a message on Facebook or Twitter and include our link, www.smartboxdesign.mobi. Welcome to our October Newsletter. 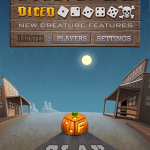 Farkle Diced – Halloween edition, includes new ghoulish artwork, engaging eerie sound effects, and plenty of scary surprises, all for free. 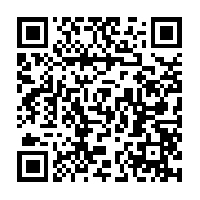 Click the handy link below or point your phone’s camera using a QR reader to install Farkle directly to your phone. 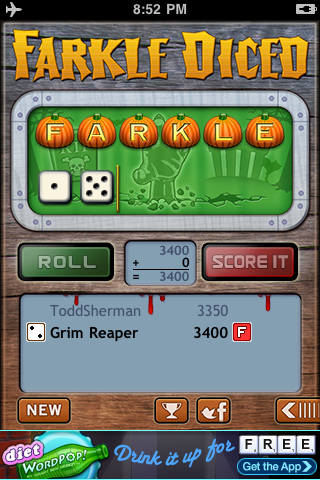 We went from, “Wouldn’t it be fun to create a Halloween version of Farkle!” to submitting it to Apple in 13 days flat. That was fast! The app came out great and is now with Apple pending approval. The Android version is not far behind. Click on image to see the entire art. Zombie Asset Management – The entire team is required to use SVN to check in and out files. Thus all code, art, sound, text changes, even marketing material goes through this system. 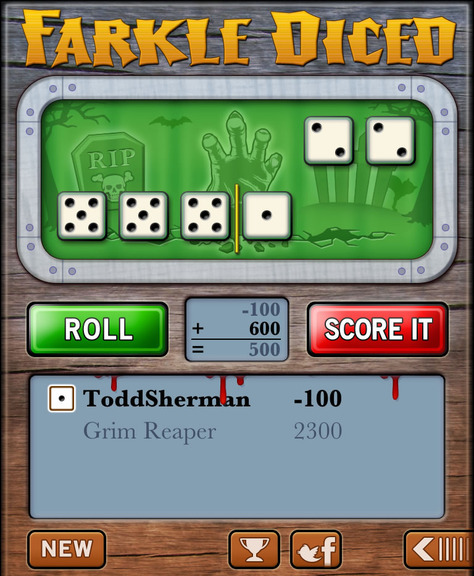 We decided up front that we would see how far we could get, in 7 days, by simply swapping out the current Farkle Dice files with new Halloween files, this is often called as skinning. Wyatt quickly made a branch off the trunk for the code and we dove in with our eyes wide shut. So like Zombies, no thinking allowed, simply replace what we had, one for one, a rule we had to break several times. Terrifying Text – My first task was to change the localization text to terrifying text. Not every developer makes a single file for all the text for the app, but we do, as we localize our games into other languages. Creating this file really paid off when making the Halloween version. Because instead of having to track down all the text strings, I had one file, that I was translating into something scary. So Player 1, became, Undead Player 1, AI player Stead Stan, became the Grim Reaper. Winning the game became Surviving. It was really fun thinking of ghoulish words to use. 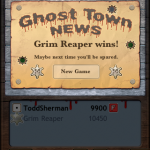 Spooky Sounds – Finding new sound effects was very time consuming. I don’t have a library of Halloween sounds so I spend hours going through several sites I commonly use and gathered an online library of sound effects. While I was doing this, Jim was starting to hand off some art. After I saw the style of the art and the theme he was going for, I tossed many of the sounds I found and searched for new ones. Jim was creating art that reminded me of classic horror movies while I was headed in more of the modern Zombie direction. But his art was fantastic so I found werewolf howls, screams, blood splatters that I liked, purchased them, then renamed the files exactly what existed in the code for the non-Halloween version, and then checked them in. The hardest sound to find was for the title screen. I really wanted a spooky theme song, but I did not like anything I heard. They were either too dramatic, like Jason chasing you with a knife or the song reminded me of some satanical ritual. I did find some great ambiance tracks and the one I purchased worked great. I used Audacity to do some basic mixing of sound effects and editing. What a great free tool. Killer Art – Jim has been responsible for all the art for all our games for years. He was instantly enthusiastic and I think started to draw before the meeting was over. 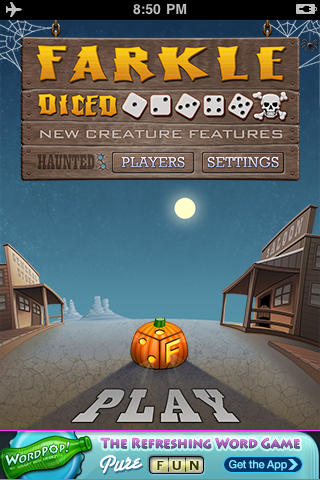 He handed off the title page first with some witch and bat animations and replaced the dice with pumpkins. This visual was a huge WOW. It also let me see a different side of Jim, a scary ghoulish side, which was great, although I am locking my doors now at my house. As I mentioned above, the art helped me focus the sound files. I think Jim must have drawn with both hands and feet because in about 5 days he had handed off most of the art for iPad, iPhone, including retina. We had very few discussions around the art as we trusted Jim to deliver. 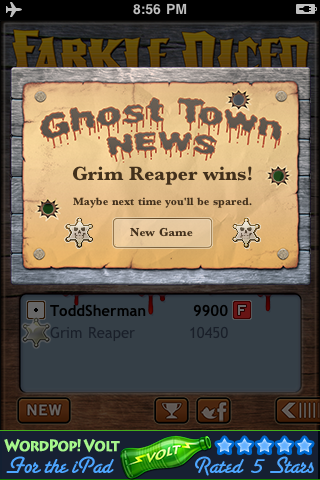 I especially like the little things he added, like blood dripping on the characters name on the game board. Jim is now converting the art to work on Android tablets and phones. Eerie Engineering – Wyatt quickly made a branch of the existing Farkle Dice code for the team to access and provided constant direction to the team when we had hand-off questions. Wyatt, took the lead designer role for the title screen and other areas. Jim handed off the art and I handed off the sound effect. The only direction we gave Wyatt for the title screen was, “Make it fun” and he did. The bat flying around and the witch swopping by are some of my favorite parts of the app. To keep the QA minimal, we dropped iOS 3.x support and concentrated on 4.x – 5.x beta. Wyatt was making builds for us to try on a regular bases. And although we started out with the rule of one to one replacement, we handed off to Wyatt sounds that needed to play in new spots and new animations. Then at the very last day I asked Wyatt to add two custom fonts. We were all tired by now, but Wyatt did it and now the menus and dialogs have that extra scary look. Morbid Android – We are now repeating the process for the Android version. John is lead engineer and is having a lot of fun with the build. Because of the lead time needed for Apple to approve and since there is no approval for Google apps it made sense to start with the Apple version. John is rapidly creating the app and he is about 85% or more done. We converted the sound files to MP3 and Jim is redoing the size of the art. John has been sending builds almost hourly for us to review and adding his own design style to make it great on Android. The App was the Spec – Beyond basic notes from our meetings, emails flying back and forth, and a few spreadsheets in Google Docs, there was no traditional specification. The App was a living prototype and specification along with the code. When we discussed a design issue, we were either pointing to the game or to the code repository. Such as, look at this file, or here’s a screenshot, can you change this to that. This worked well given the time frame and our past experience working with each other paid off. Email me at tsherman@smartboxdesign.com if you have any questions. I will post links to the stores as soon at the app is approved in iTunes and uploaded to Google Market and Amazon.